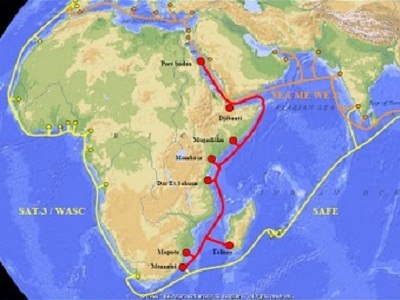 Posted on April 10, 2012, in Lessons from Failures and tagged cable damage, EASSy, East Africa, internet, Zimbabwe. Bookmark the permalink. 5 Comments. Mitsuyuki– what interesting comparison! Thank you for sharing. I like your comment because your example is from more than a century ago and yet it still shows ways that globalization was occurring. While farmers were deeply affected by the functioning of the railroad, the railroads themselves were built largely by Chinese immigrants. Our global economy is much older than many people think. And dependence on infrastructure, as you pointed out is foundational to economic and technological advancement. This article reminds me of the monopoly of the railroad. The wheat growers in California in 1900s relied heavily on the railroad selling their products. If the line had been damaged, or the company had raised its tariff, it would have been “more detrimental, deeply felt affect” for the farmers. It has the like analogy to the ICTs. This article reveals that our information communications technology actually depends on the comparatively monopolistic infrastructure, like an under-water fibre-optic cable. Once the line has been damaged as you mentioned, its effect will be huge and international. Moreover, there seems to be no media in which the policies of the operating company of the communicating infrastructure have more impact upon our daily life than ICTs. Unlike conventional ways of communication, ICTs afford various possibilities of unlimited access to the world, however, to ensure that we can truly enjoy the benefits of world wide web, it is the competitive markets for the communicating infrastructure that counts.